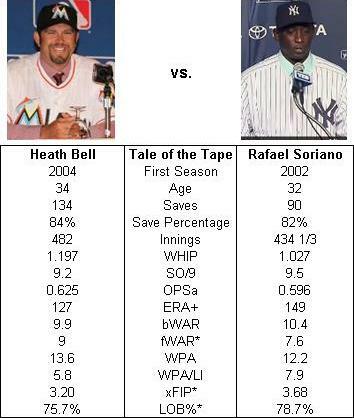 Not only does Soriano compare favorably to Bell, but he also stacks up well against most other relievers since 2006. Obviously, health is always a concern with Soriano, but otherwise, the right hander is as talented as all but the very elite closers in the game. For that reason, the Yankees shouldn’t be looking to just give him away. Unless the team can immediately convert the cash savings into an upgrade in the starting rotation, the Yankees might actually be better off keeping a stacked bullpen and hoping a strong relief corps can compensate for a potentially shaky rotation. However, if another team values Soriano enough to consider taking on most of his now only two-year deal, Cashman should be ready to pull the trigger. Between A.J. Burnett and Rafael Soriano, the Yankees are paying almost $30 million over the next two seasons to a pair of pitchers they (and most fans) would probably rather not have on the team. There has already been some talk about the Yankees unloading Burnett, so if Cashman could somehow find a way to trim Soriano as well, the offseason would all of a sudden seem like a success. More than just addition by subtraction, the added payroll flexibility might not only mean the Yankees can pursue a short-term starting pitcher, but it could also set them up well for a more aggressive posture next offseason. Good article, only question is what does AAV mean?